This document is only available in German, Danish, Swedish, Norwegian, Finnish, English, Spanish and Dutch . 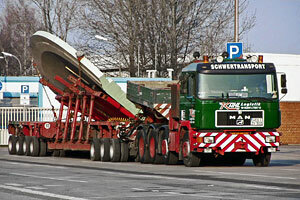 Welcome to the website www.transportxxl.eu dealing with the topic of abnormal transports. Here, you will find an overview of the regulations and application procedures for oversized and heavy transports in the EU. At the moment the website contained the following EU contries: Denmark, Germany, Great Britain, Finland, France, Netherlands, Norway, Spain and Sweden. Transports which exceed the maximum authorised weight or axle load are referred to as “heavy transports”. Transports whose dimensions exceed the maximum authorised values are referred to as “oversized transports” (or, in some countries, as “high and wide transports”). The term “abnormal transport” is used on this website as a collective term for oversized and heavy transports. In the section EU Directive you will find the maximum authorised dimensions and weights with which a transport can be made on European roads without a special permit. You can determine whether you will need a special permit for your transport in the VIKING Region under the category Does my transport require a special permit? The application procedures for each country, as well as contact information for the responsible authorities and links for required forms, can be found under Application procedures. We hope to be able to provide you with some useful information through this site and wish you great success in your search!